If you are planning on going mountain biking in the US this summer you are sure to have an amazing time. Not only is the weather throughout the summer months generally fantastic but the wide selection of mountain biking destinations ensures that no two trails will be the same. Today one of our guest bloggers has come up with an awesome article about the top 10 mountain biking destinations in the US. Do you agree with his choices, or would you add anything else to the list? Let us know in the comments. 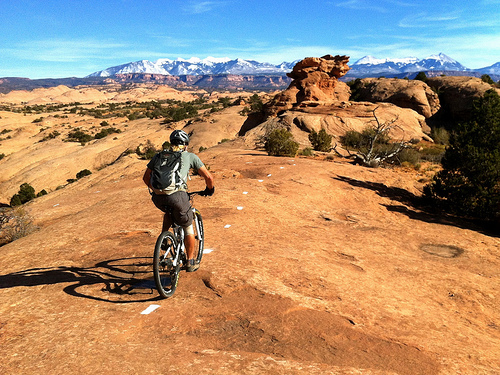 Utah has to be one of the top mountain biking Mecca’s in the US today. It has all the ingredients that make for a great biking experience; terrain, scenery, and that sense of adventure. The Amasa Back Trail in Moab, Utah is one great trail you must visit in the area. The trail begins with a climb from Kane Creek towards the west of Moab up to the sandstone ridges overlooking Colorado. Start early as it’s a VERY popular trail with bikers and is usually crowded over weekends and holidays. Tapering off at 11.06 miles at between 4,000 and 4,800 feet above sea level, the looping trail requires quite a bit of experience as a biker and may be categorized as being technically and physically moderate to extreme and demanding, taking you anything from two to five hours to complete. Nevertheless, stunning views of the nearby Jackson Hole make the trail all the more worth it. 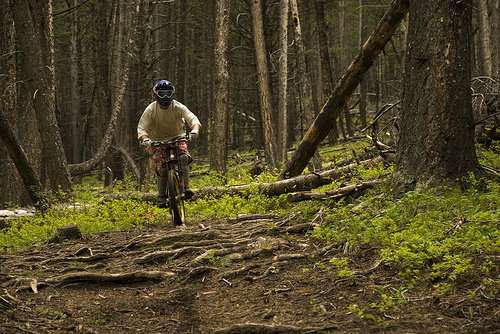 Park City offers over 150 miles of public trails ranging from easy tracks to adrenaline-pumping trails. Holly’s Downhill is a 4-mile extreme downhill trail that pushes the wind into your back as gravity urges you on towards the base. Similarly, Homeward Bound is a 3-mile single-track stretch that also creates extreme downhill speeds but has some free styling ridges along the way, which are great for those random stunts. On the moderate to easy side, the area offers up to a dozen different trails including Beaver Creek Trail, Deer Valley Resort, Glenwild Loop, Lake Side Trails, Mid-Mountain Trail, among others. Park City doubles up as a ski resort over winter and as such, the biking trails are only available during summer months. Gunnison, Colorado is one of the less-beaten tracks in mountain biking trails. The area offers hundreds of miles worth of slick-rock trails, which sometimes run parallel to the scenic Colorado River. The area has over two dozen tracks to choose from with most offering medium to challenging rides. 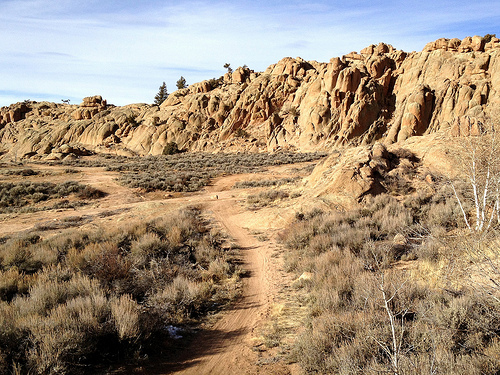 The Hartman Rocks biking system is one trail that stands out. It’s not quite a biking trail but more of a system owing to the miles upon miles of numerous trails that interconnect to give you an excellent opportunity at truly going wild. You may even opt to camp out and explore as many of the trails as you can. To give you some perspective of the trails, they traverse some 6,000 plus acres on a 7700 foot elevation. This is one of the best trails in the US as it offers you real freedom in choosing the length and range of your biking excursion. 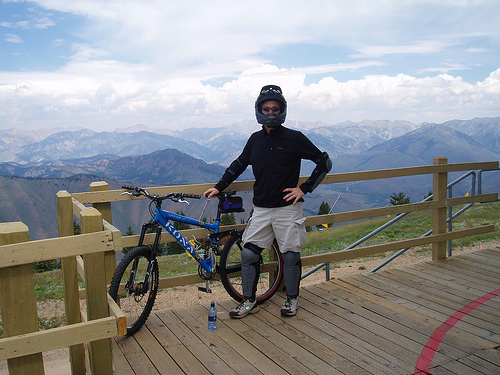 Colorado is mountain country, and therefore one of the best mountain biking destinations in the US. The stunning views of the Rockies will send shivers down your back, but be careful not to get distracted by the sheer beauty of the mountain ranges. Of all the trails in Colorado, the best has to be Deer Creek Trail. This out-and-back trail sets you off on a 10-mile single-track trail that takes you quite literally into the middle of nowhere. The best part about this trail is the remoteness that it offers, in contrast to most popular trails in the area. If you head out very early, you will have the trail to yourself, and get the chance to experience twenty plus miles of pure biking bliss. Be advised, however, that the trail is a series of steep ascents and descents and that the air can get pretty thin at times due to the 9,000 meters plus altitude, but the payoff is definitely worth it and you will enjoy every moment of it. This area has some great scenery and fairly exciting albeit challenging trails, top of which is Armstrong Saxon Creek. The trail begins with a climb that snakes through huge boulders to an area which may prove to be quite exerting owing to the loose surface. The great scenery will, however, probably distract you from the challenges at hand. The climb will take you anything from two to four hours and tops off at the summit of the trail. The downhill drop is what makes this climb every bit worth it as it provides an almost 98% downhill rollercoaster ride, great for any thrill-seeking bikers. The descent tappers out to the legendary Mr. Toad, a section that forces you to kick up your speed while offering no visibility at all. Watch out for this and as most bikers will tell you, keep your brakes squeezed all the way and do not let the trail take control of your bike. 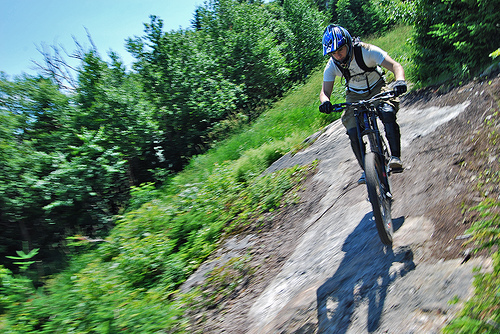 Kingdom Trails in East Burke, Vermont offer the best biking trails in the area. Bike Magazine voted the trail network as the best in North America, and for very good reason. Kingdom Trails comprise a series of trails that offer something for everyone; from beginner to seasoned biker. Darling Hill is a cross country trail system that leads bikers into vast pastoral areas with rolling meadows and panoramic views. 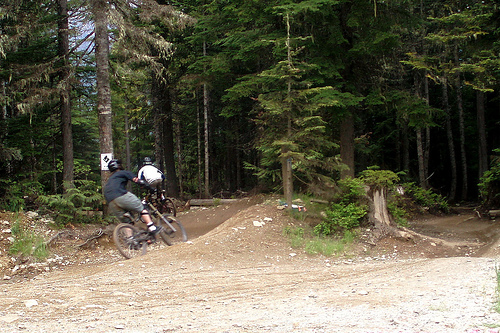 For the more seasoned biker, the Burke Mountain trails are best. The mountain top trail offers two trails, the Downhill trails and the Freeride trail, both of which can be tackled using a hard-tail mountain bike. The third trail system is the Burke Bike Park, which has 100 miles worth of trails including steep lift-served descents and slopping high speed gravity downhill trails. Bangtail Divide Drive in Bozeman, Montana is an easy-going trail offering one of the most stunning views of natural scenery the US has to offer. The trail has been cut out, is well maintained, and is best suited for a bike ride that won’t tax you too much, leaving you to enjoy the scenery. Twenty three miles of pure biking bliss through a single track trail will put you at the heart of typical Montana country seasoned with fresh smells of pine and wild flowers. If you think the two or three hour ride up is great, wait till you hit the descending trail. The descent can get so smooth and easy, you may be tempted to let loose and cruise at a higher speed but a few cut backs will require you to slow down. 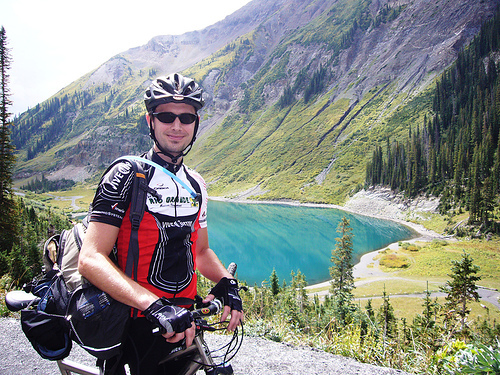 Bozeman promises an easy climb and some stunning scenery and even though it may take you up to 6 hours to reach an altitude of 5,560 feet, it is worth every minute of it. This area has inherited the same features that have shaped great skiing resorts so the great mountain biking comes as no surprise. 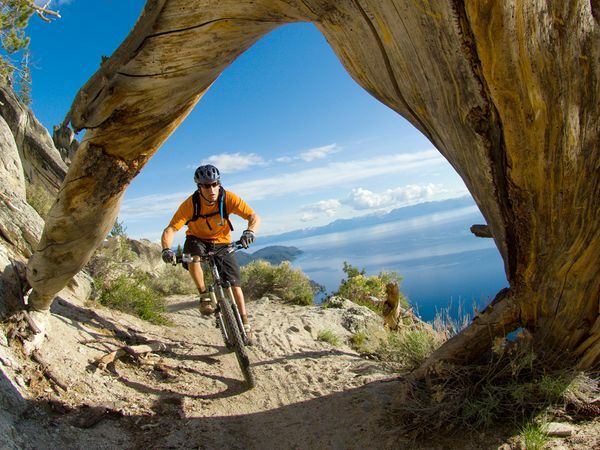 Exhibiting mountainous terrain with smooth slopes, the area boasts some of the best mountain biking trails in the US. The top destination in the area is Bald Mountain, given this name owing to the smooth nature of the slopes and the peaks. Offering up to 28 miles of trails running up to an elevation of 3,000 feet, the trail has something to offer the experienced biker as well as the newbie rider who may want a moderately easy climb in order to take in the spectacular views of the area. For the more luxuriant biker, check out the White Clouds trail which starts off at a lodge and offers access to great facilities and hospitality amenities. Known to have a deep-rooted biking culture, Bend Oregon is traversed by up to three dozen trails that each offer great outdoor experiences for bikers. 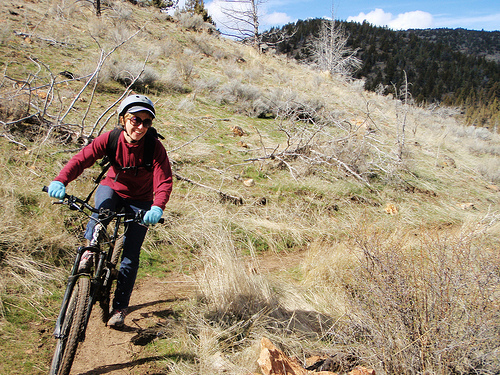 Two of the highest rated trails in Bend are Phil’s Trail Loop and Dutchman Flagline Loop. 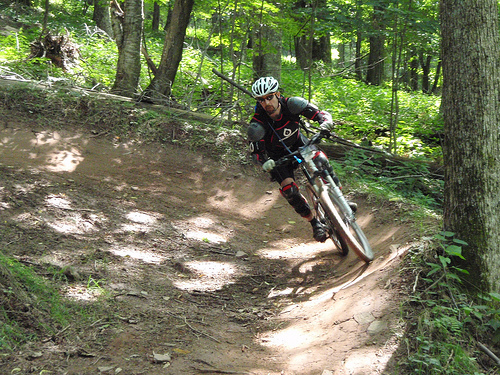 Phil’s trail is a 9 mile single-track trail that offers mountain bikers an easy but enjoyable ride. Average speeds on the trail peak at just over 7 miles per hour. Dutchman Flagline is a more advanced trail comprising three to four different trails, depending on the sort of loops you want to create. Flagline Trail is best biked as a looping trail and may start from either Skyliner Trailhead or Tumalo Falls Trailhead. Although it is one of the best trails in the US, it also has a very short season owing to winter snow, which tends to thaw out well into summer. This however makes the trail a certain rarity meaning adding it to your biking to-do list is a must. This trail takes you through the heart of one of the most beautiful and breathtaking forests in the US. The 37 mile trail winds through the tapering and rocky trails within the Mon, as the forest is locally known. Previously used as logging routs, the trails give you the sort of access to the forest that other trails made for biking cannot offer. Located within Pocahontas County, the forest comprises some 900,000 acres of woods making up a vast paradise of forest wood and natural wilderness. The trails are anything from moderate to difficult, but the general lay of the land offers great excursion possibilities with hundreds of miles of alternative trails that may be taken. In addition to the biking trail, other great destinations lie within easy reach of the trails including Cranberry Mountain Nature Center, Cranberry Wilderness Area, the Highland Scenic Highway, and Falls of Hills Creek. This artcle was produced by X1 Sports Insurance. They offer cheap Mountain Bike Insurance. You can also see this article as an infographic by clicking here. This entry was posted in California, Colorado, Idaho, Land Sports, Montana, Mountain Biking, Oregon, Travel, United States, Utah, Vermont, West Virginia and tagged California, Colorado, Idaho, Montana, Mountain Biking, Mountain Biking Trails, Oregon, United States, US, Utah, Vermont, West Virginia. Bookmark the permalink.